This pack includes 450 9x12 Flat size Certified Mail Envelopes. Each envelope holds up to 63 pages of paper, is bright white in color and includes the required USPS Certified Mail banner printed on each envelope. 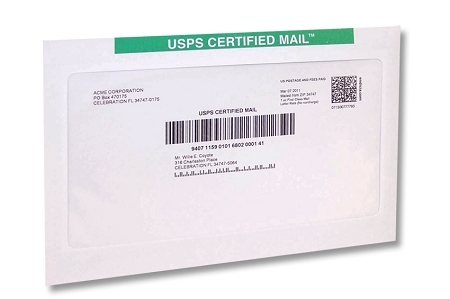 This envelope was designed to be used with Certified Mail Labels website to address, track and print USPS Certified Mail bar codes with PC Postage. 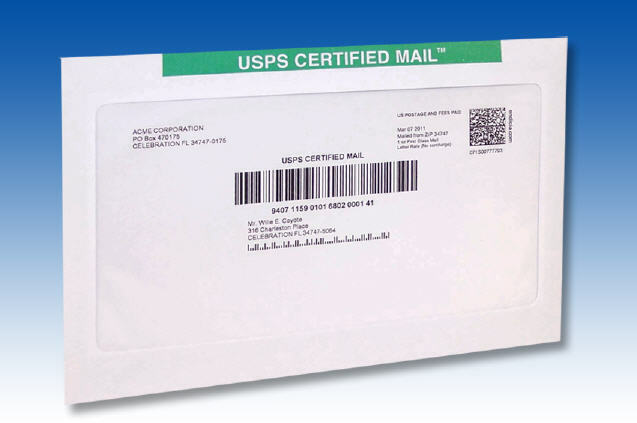 Our envelopes are made in the USA and have been approved by the United States Postal Service (USPS) to send USPS Certified Mail with Return Receipt Electronic Signatures, Restricted Delivery Certified Mail and Certified Mail with Priority Mail 2-3 day delivery.